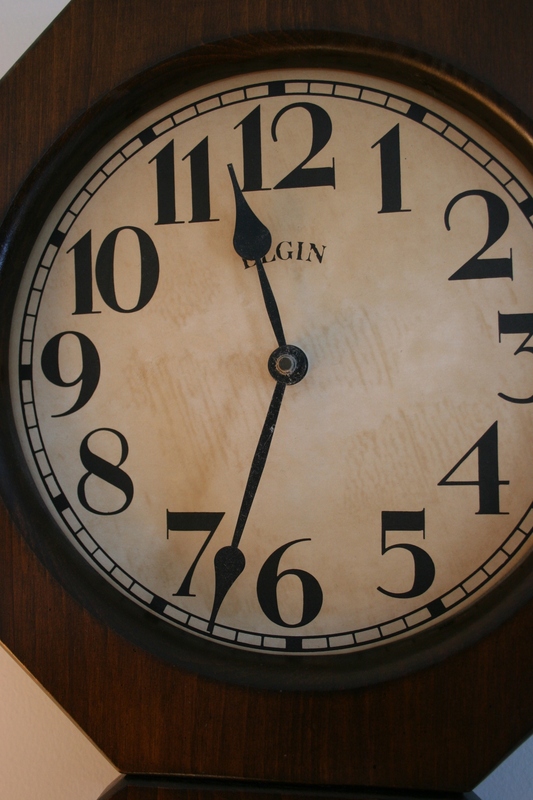 MY HUSBAND CALLED late yesterday afternoon. “I’m at the clinic.” Those are words a wife does not want to hear. “What did you do?” The question popped automatically out of my mouth. This did not sound good, not good at all. 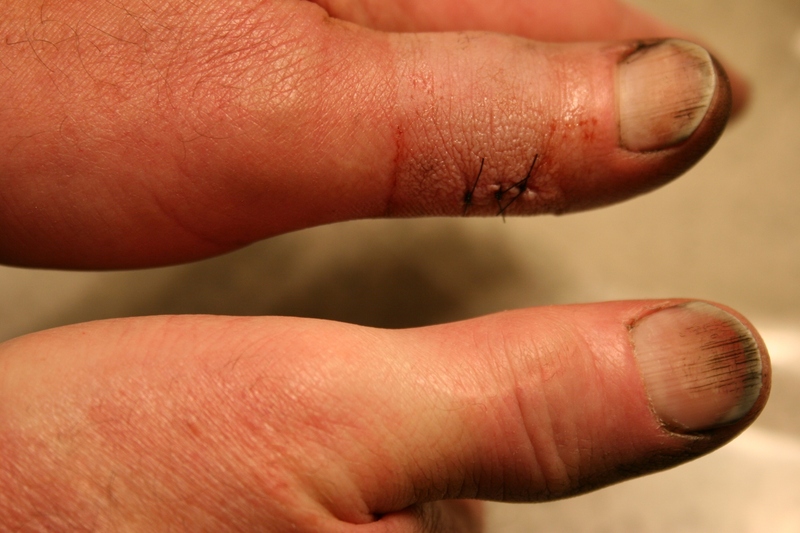 For my automotive machinist spouse, his hands are his tools, so these types of injuries always concern me. 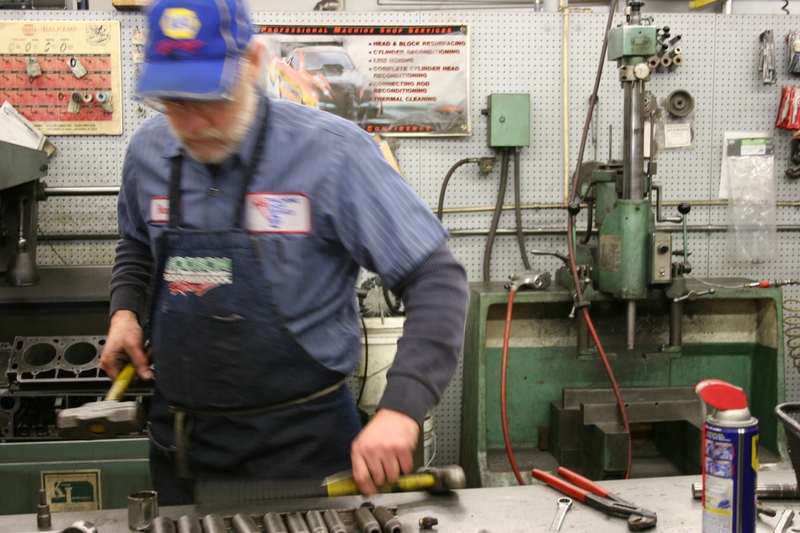 My husband at work with a hammer, a tool he uses often as an automotive machinist. I hung up, then worried and fretted and worried some more while waiting for a follow-up phone call. 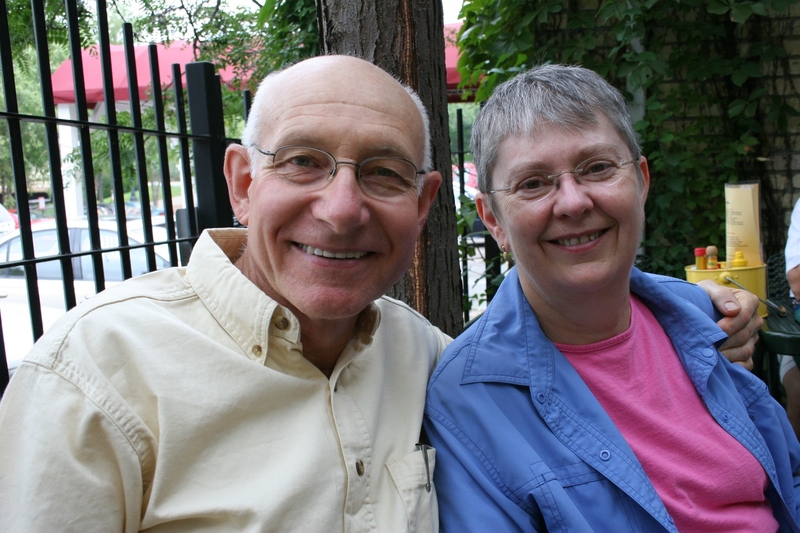 Forty-five minutes later he called from the Northfield clinic to say he was on his way home to Faribault. 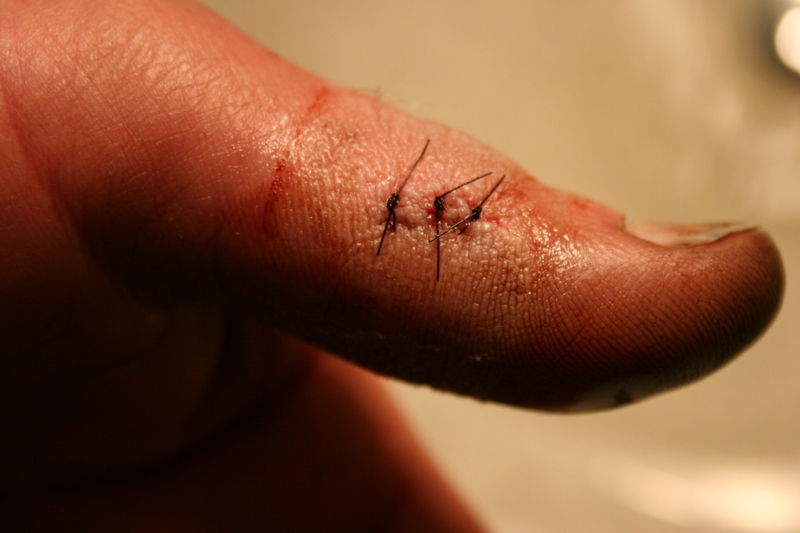 The injured, and stitched, left thumb. My husband says I will gross you out with this image. To abate his concerns, I've down-sized the photo. He claims he didn’t injure the thumb prior to yesterday. I doubt that statement. Throughout our 28 ½ years of marriage, he’s hit his thumbs more than once with a hammer at work, although certainly not this severely. Here's proof of a previous injury. Note the semi-circle scar on the right thumb, the telltale mark of stitches from an earlier injury. This time he delivered a glancing blow to his left thumb with a two-pound hammer while pounding universal joints out of a drive shaft. Ouch. He’s off to work this morning, despite the doctor’s instructions that he stay home. He told her he couldn’t. Too much work and he wasn’t going to let an injury like this keep him down. He possesses a strong work ethic and a degree of German stubbornness. The physician conceded, told him to keep the thumb clean and dry. I’m uncertain how he will manage that given the nature of his job gets his hands dirty and greasy. 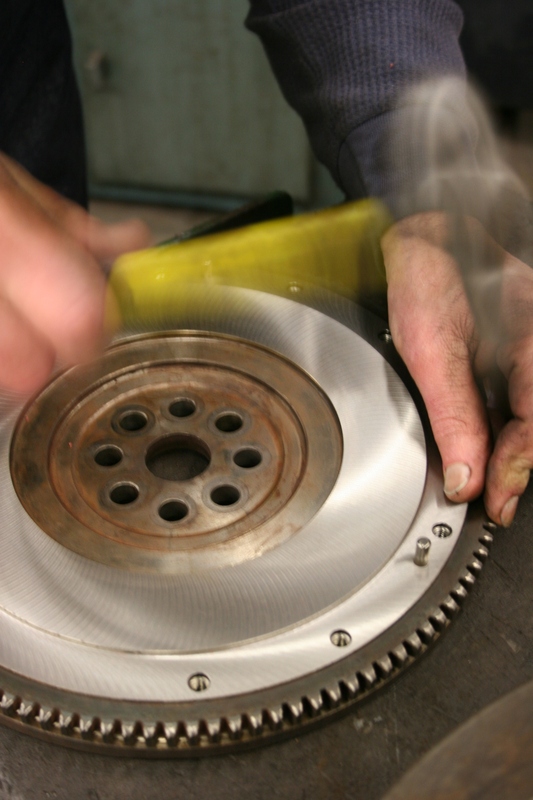 My husband at work in the automotive machine shop where he is employed. This morning he struggled to button his shirt. How will he operate machinery, deal with heavy and grimy automotive parts? But, he’s determined. My concern, a few stitches, a clumsy splint, swelling and a little pain aren’t going to stop him from working. I HAVE FOND CHILDHOOD memories of Ham Day in my hometown of Vesta, a farming community of some 350 on the southwestern Minnesota prairie. When I was growing up, Vesta boasted a one-block main street lined with businesses. Today you’ll find a bank on one corner, the municipal liquor store on another, a café a stone’s throw away, the post office and that’s about it in the heart of town. Back then, the Commercial Club sponsored an annual December Ham Day at the community hall. This offered an opportunity for local businesses to thank customers by giving away hams in a drawing. 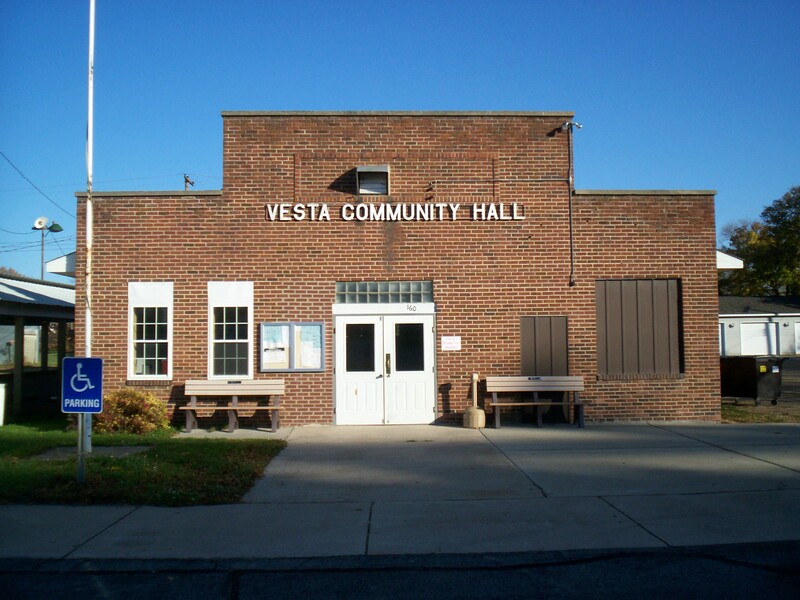 The Vesta Community Hall, site of the annual Ham Day in December. It also gave farm families an opportunity to socialize and, well, win a ham. You can bet my dad made sure his six kids signed up at as many businesses as possible for the ham give-away. Every year we went home with a ham. But that’s not all. We kids also got goodie bags parceled out by Santa Claus, played by my Uncle Clarence. After the drawing, we would tromp outside and form a line into the Legion Hall. There Santa handed each kid a brown paper bag packed with peanuts, an apple, an orange, a marshmallow Santa and, best of all, a chocolate Hershey bar. Could life get any sweeter? Not for this farm girl. With Ham Day forever a part of my cherished Christmas memories, I wondered what holiday happenings out there might hold special memories for today’s generation. 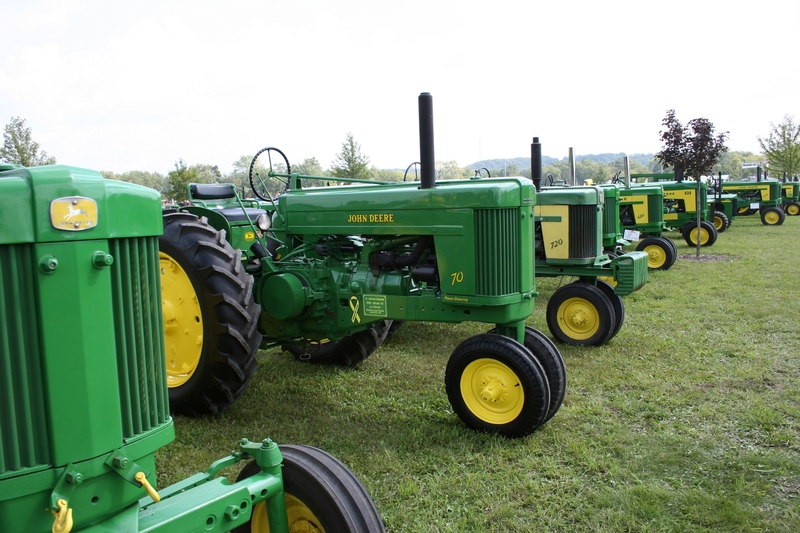 John Deere tractors galore lined up at the 2009 Rice County Steam & Gas Engine Show. Santa will likely arrive on a newer model John Deere at this week's SEMA Equipment holiday open houses. SANTAS ARRIVE IN JOHN DEERE tractors at SEMA Equipment, Inc. holiday open houses this week. From 5 p.m. – 7 p.m. Thursday, December 2, Santa will be at the ag implement dealership in Wanamingo. From 9 a.m. – noon on Saturday, December 4, Santa will simultaneously appear at SEMA in LeRoy, Plainview, Spring Valley, St. Charles and Austin. Don’t ask me how. But Santa is magical and I suppose he can be in five places at once. IF YOU WANT TO ATTEND A TORCHLIGHT parade and dislike big city traffic and crowds (like me), take the kiddos over to Montgomery for the annual Torchlight Parade & Fireworks beginning at 6:30 p.m. on Thursday, December 2. Post parade you’ll be treated to a beautiful computer-choreographed fireworks display set to holiday music. 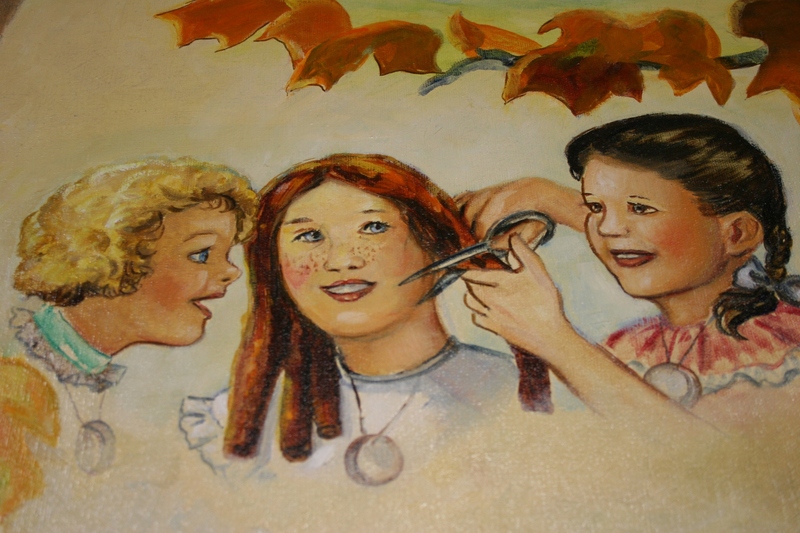 Book characters Tib, left, Tacy and Betsy, in a mural in the Maud Hart Lovelace Children's Wing at the Blue Earth County Library in Mankato. Marian Anderson painted scenes from the 10 Betsy-Tacy books. CHILDREN (AND ADULTS) who are fans of the Betsy-Tacy books by Maud Hart Lovelace can experience an old-fashioned Victorian Christmas from 1 p.m. – 4 p.m. Saturday, December 4, at the Betsy-Tacy houses in Mankato. Costumed characters will represent Betsy Ray and her family. Carolers will entertain. Refreshments will be served in the across-the-street houses decorated for the holidays. 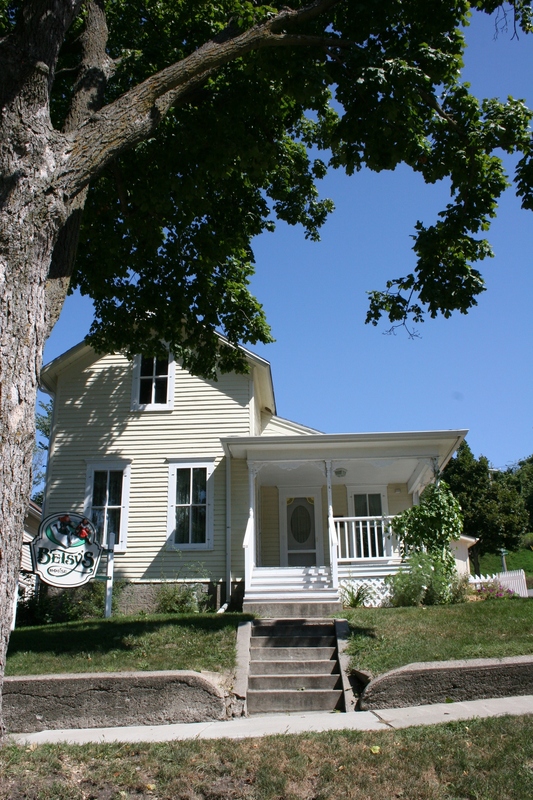 Betsy Ray's (Maud Hart Lovelace) house along Center Street in Mankato, photographed this past summer. UP NORTH IN HUBBARD, eight miles south of Park Rapids, you’ll find another interesting holiday happening which is likely more suited for adults than kids. The Long Lake Theater’s production of Ole & Lena’s It’s a Wonderful Life opens Thursday, December 2, for a two-week, eight-day run. The last show is December 12. Billed as a parody of the beloved Christmas classic with a Minnesota twist, the performance features those well-known Minnesota Scandinavians, Ole and Lena. 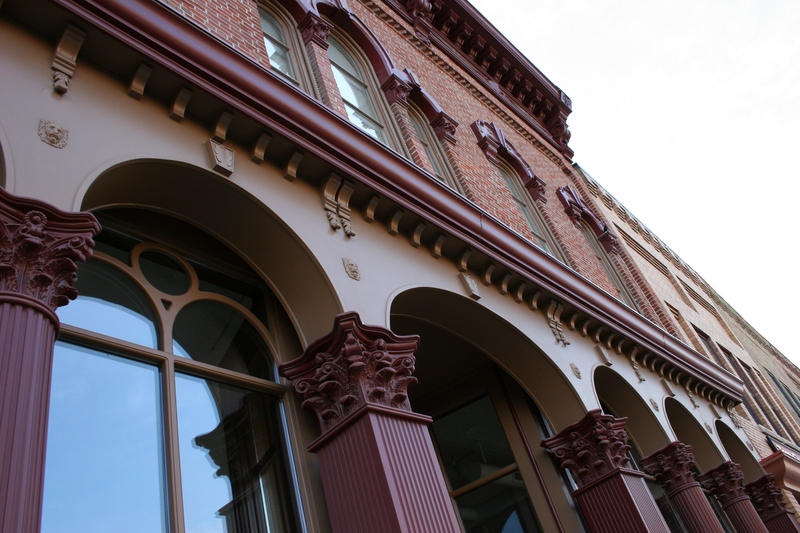 Santa stops at the beautifully-restored Bachrach Building in downtown Faribault on Saturday. SANTA WILL POSE for pictures and visit with kids in Faribault during a Hometown Holidays event from 1 p.m. – 4 p.m. Saturday, December 4, in the Bachrach Building, 318 N. Central Avenue. (No mention of goodie bags.) Other activities include cookie decorating and ornament making. Across the street at the Paradise Center for the Arts, holiday storytime begins at 3 p.m. The Faribault High School Band the local Girl Scouts will also provide musical entertainment. Old Trondhjem Church, photographed in the summer. 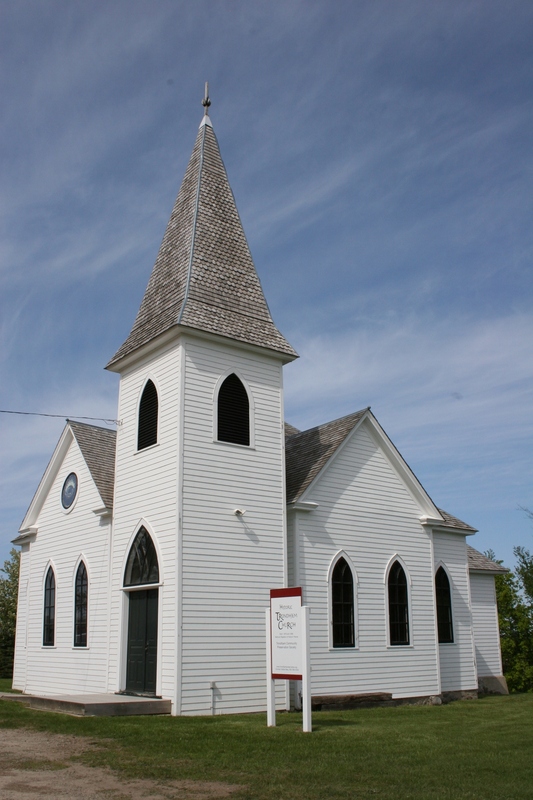 A CONCERT OF CHRISTMAS favorites will surely get you in the holiday spirit at a Norwegian country church near Lonsdale. 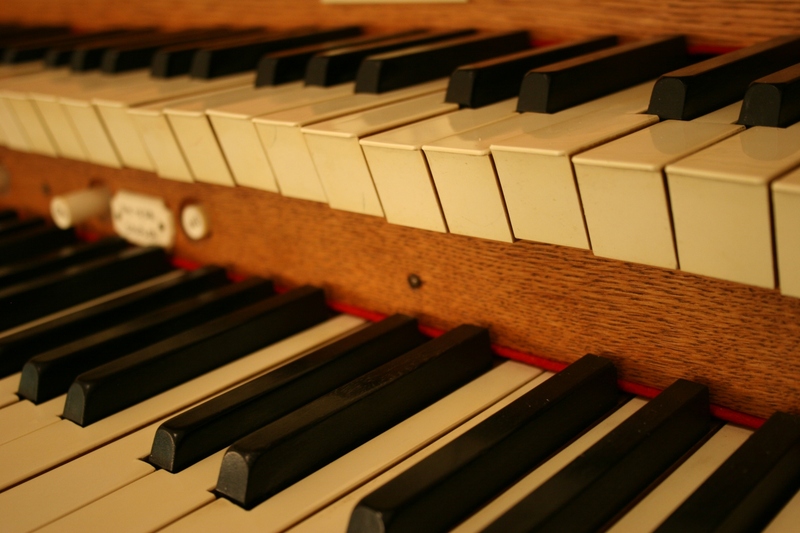 The historic church presents “Sounds of Christmas at Old Trondhjem: Janet White and Friends” at 2 p.m. on Sunday, December 12. IF YOU KNOW of an interesting holiday activity in your Minnesota neighborhood, submit the information in a comment or an email. I’ll start a list and share the information in an upcoming post/posts. Likewise, if you have wonderful memories of a childhood Christmas event like Ham Day in Vesta, I’d like to hear those stories too. MY HEALTH INSURANCE premium arrived in the mail yesterday. Happy holidays! It’s due shortly before Christmas. In mid-June, the premium increased from $801 to $813 for three months of coverage. Do the math. That’s $271 per month or $3,252 a year. Here’s the deal. I foolishly thought healthcare reform would mean lower premiums and lower costs for medical visits, in other words, more affordable healthcare for families like mine. We are not wealthy. We live in a modest home in a modest neighborhood. We have no debt. We spend carefully and wisely. But when it comes to health insurance, I believe the word “affordable” cannot fit, cannot even be squeezed, into the same sentence. I pay $271 a month for coverage with a $3,000 deductible. In other words, my coverage is basically major medical. I’ve evaluated getting onto my husband’s plan at work. That would cost me even more than the individual policy I have as a self-employed writer. His employer pays only a small portion of his health insurance premium and my spouse, too, has a high deductible. I haven’t crunched the numbers lately, but my family (which also includes one still-at-home 16-year-old) is forking out a lot of money every month for health insurance. Yet, we rarely go to the doctor because of the high deductibles and the high cost of healthcare. Cost is a great deterrent for skipping routine exams. I’m just being honest here. Another problem I face is past medical history. I had total hip replacement surgery in 2008. I will need a new, and very costly, hip in 15 – 20 years. Insurance companies have these policies about pre-existing conditions. So, even if I was to look for different insurance, the hip would likely be excluded from coverage. I have no answers to any of this. I just know that I am sick and tired of the high cost of health insurance and of healthcare. WHAT ARE YOUR THOUGHTS on the topic and do you have any answers? What are you spending every month on health insurance premiums? I CAN’T IMAGINE Thanksgiving without family. They make the day memorable and fun and cherished. This year 14 of us sat down to a turkey dinner at our house. That’s really a small number given if everyone from my side of the family attended, 26 of us would gather around the tables. Seldom, though, are we all together on Thanksgiving or Easter; that usually happens only at Christmas and never in my small, cramped house. My mom arrived with two cans of corn, soda crackers, cheddar cheese and other ingredients for a scalloped corn dish which she insisted I requested for my eldest. I kept insisting that I had not requested the corn and my daughter, who was called upon to help prepare the dish, kept insisting this was not her favorite corn. No matter how loudly my daughter and I protested, we could not convince my mom that we had not asked for the vegetable. 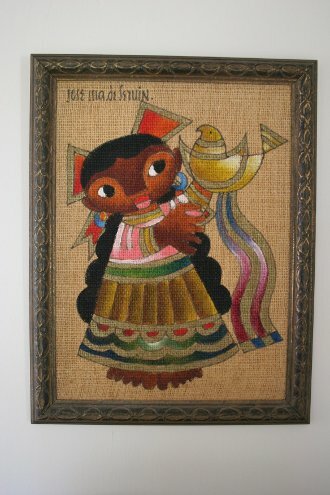 Later, when my sister, L, arrived, we learned that she had requested the corn and that our niece, H, loves it. The corn-requesting sister failed to bring the prune-filled fruit stuffing that is our mother’s favorite and which a certain sister-in-law detests. My youngest brother then shared that the first time he had Thanksgiving dinner with his in-laws, he told them he didn’t like fruit stuffing. They looked at him like he was crazy and told him they didn’t have fruit in their dressing. That same brother wore jeans to Thanksgiving dinner. This is significant because, as his wife revealed, he has not worn jeans in some 25 years. They went jean shopping on her recent birthday and my brother bought not one, but two pair, of jeans. I don’t know whether the fact that my brother is an attorney has anything to do with his two-plus decades of boycotting blue jeans or not. But I do know that he’s missed out on many years of comfort. At 11:33 a.m. on November 25, 2010, my sister, L, had nothing to say. 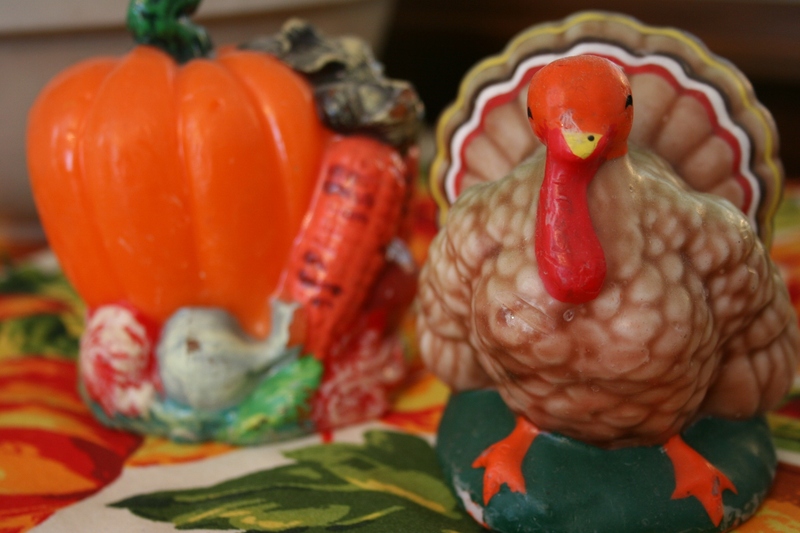 The vintage Thanksgiving candles that will never be touched by fire. During an interrogation about any men in her life, my second daughter rolled her eyes. This did not go unnoticed and a brief discussion ensued on this inherited family trait. I roll my eyes, my kids all roll their eyes and my sister and her daughter roll their eyes. My sister-in-law says her kids are not allowed to roll their eyes. Uh, huh. My husband failed to remove the foil cover from the turkey during baking. A pale white turkey is not a pleasant sight. My eldest brought a to-die-for cheesecake, which she whipped up by hand because she could not find the beaters for her hand-mixer. Two of my nieces, a nephew and my son washed and dried the dishes. My 16-year-old, who towers at six-foot-one (or is it two), complained about the low sink. My tall, tall son declares our sink "too low." 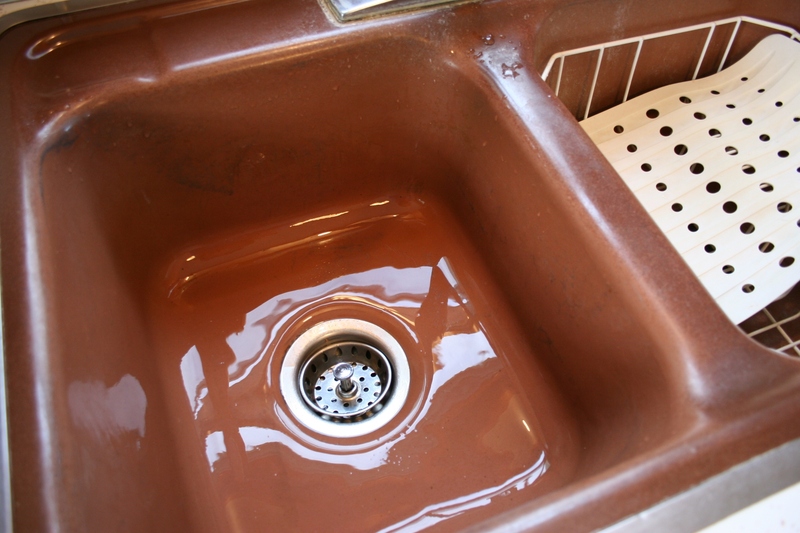 That's as good a reason as any for purchasing a replacement for my vintage brown sink, don't you think? I would really like to win a kitchen make-over. I made my sister and my middle brother and his significant other tromp outside in the cold and snow to look at siding samples for the front of our house. My sister-in-law commented on the brown shirts my son and eldest were wearing and said brown was the color to wear for Thanksgiving. 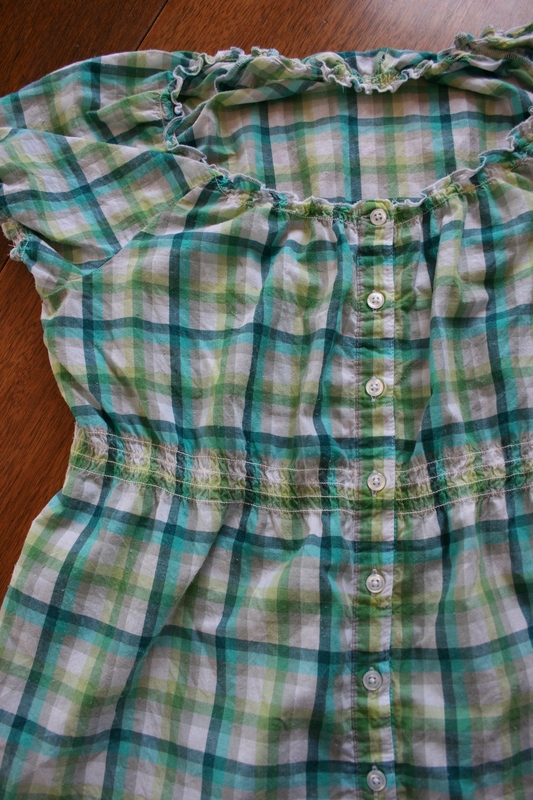 She was dressed in a button-up red sweater and a shirt she would have to button over if she was in church. She told me I was wearing an Easter shirt. I told her I didn’t care. I have never pretended to be fashionable. I wore this "Easter shirt" for Thanksgiving because I wanted to be cool (I'm a woman over 50) and comfortable while working in the kitchen. Family members gathered around the dining room table after dinner poring over newspaper ads. None of us, except the momentarily speechless sister (see above), shops on Black Friday. She informed us that she enjoys the thrill of the hunt while regaling us with stories about shoving shoppers and angry shoppers in the parking lot. She successfully convinced all of us to stay home on Black Friday. 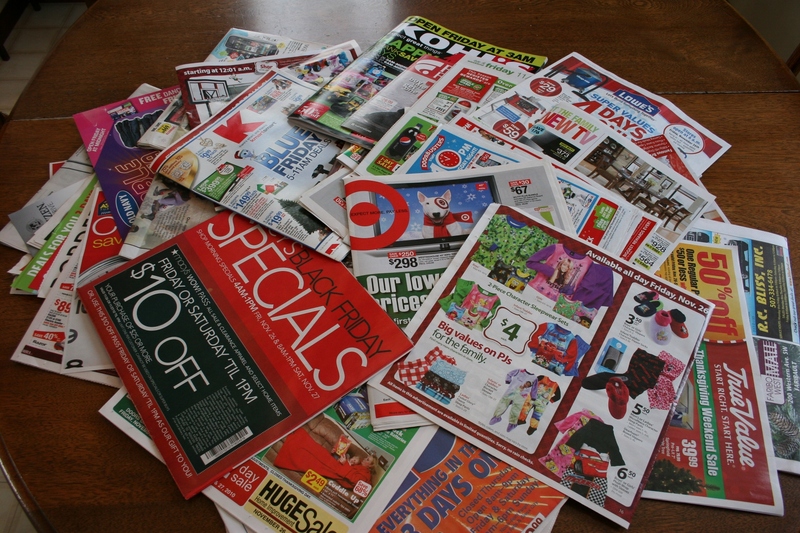 My brother and sister-in-law brought a stack of newspaper ads for us to peruse after dinner. WHAT ARE YOUR THANKSGIVING stories? 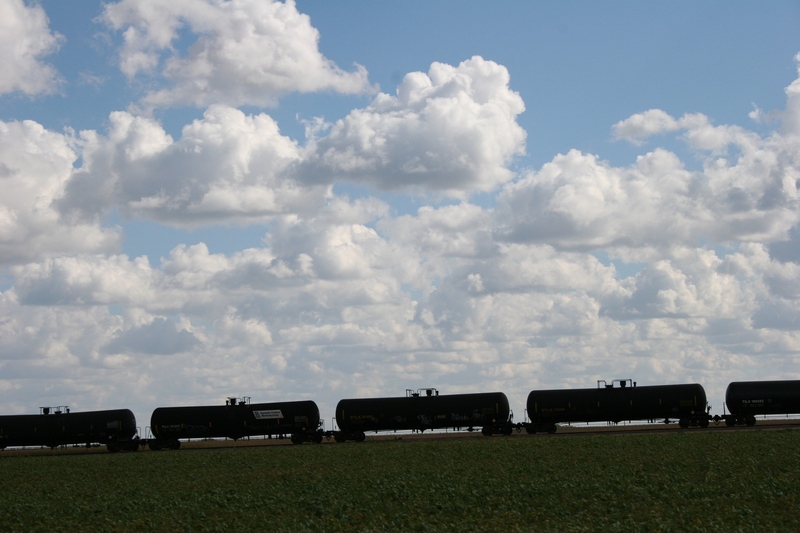 If you have a publishable story to share, send it my way via a comment to Minnesota Prairie Roots. 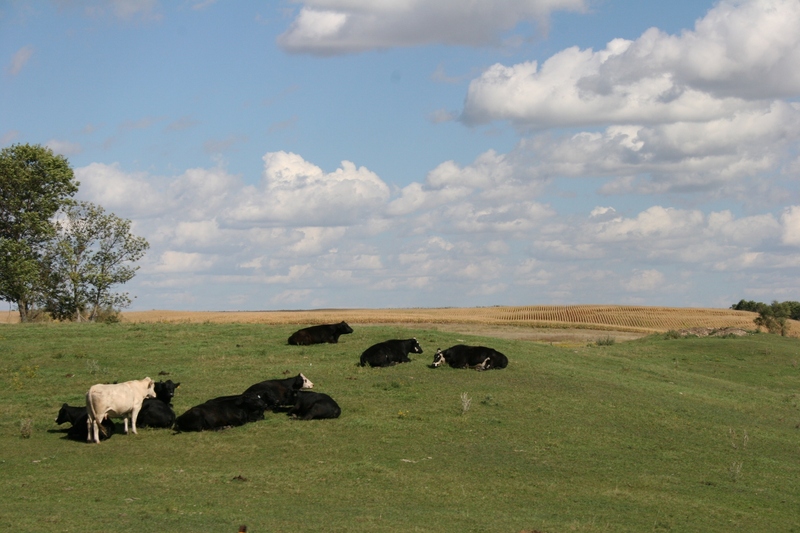 Cattle grazing along U.S. Highway 71 in southwestern Minnesota. 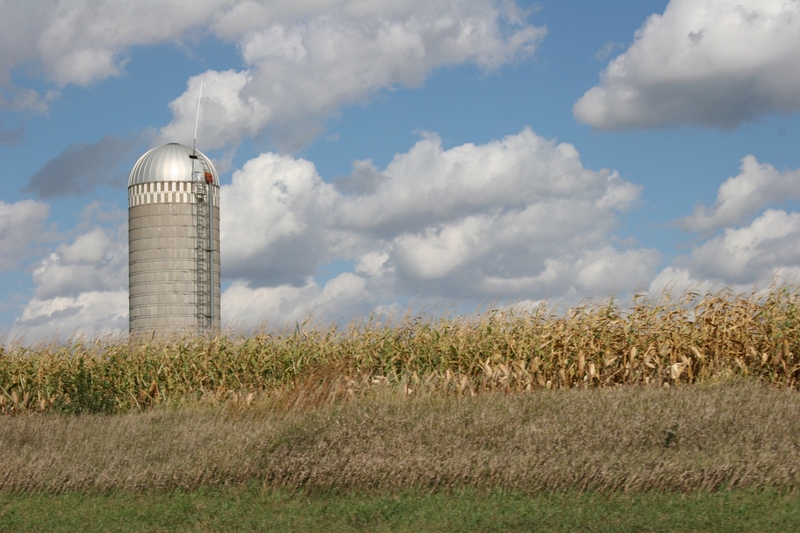 Silo and cornfield along U.S. Highway 71. So... I didn't have a photo of ravens. 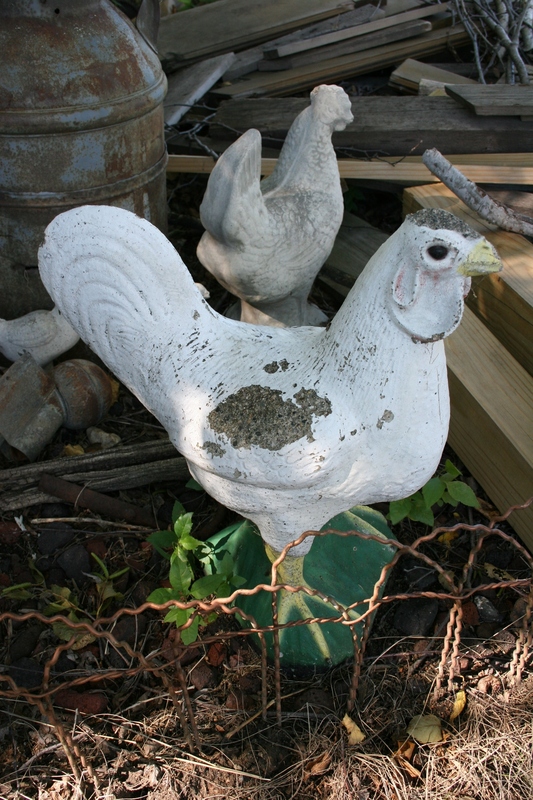 These chickens from Prairie Winds Antiques in Springfield will have to substitute. I hope, dear readers, that your Thanksgiving, your year, has been blessed with music, with sunshine following the rain, with green grass under your feet, with food for your table and, most of all, with the love of family and of friends. The third book in the Farm Country series. WHENEVER I OPEN one of Lakeville author Gordon Fredrickson’s books, I feel like I’m stepping back in time to my childhood on a southwestern Minnesota dairy farm. I’m thankful for Fredrickson, who understands the value in preserving the history of small family farms. Because he was raised on a Scott County dairy farm and farmed for awhile as an adult with his wife, Nancy, Fredrickson gets his 1950s era farm stories right. 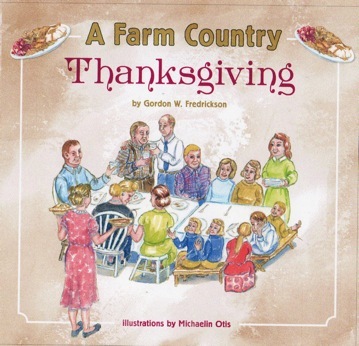 Last night I snuggled up in the recliner with his latest children’s picture book, A Farm Country Thanksgiving. I thought it would be a fairly quick read, but I was wrong. I didn’t whiz through this story told from the viewpoint of 10-year-old farm boy Jimmy. Rather, I savored every rhyming word by Fredrickson and every detailed illustration by Michaelin Otis. 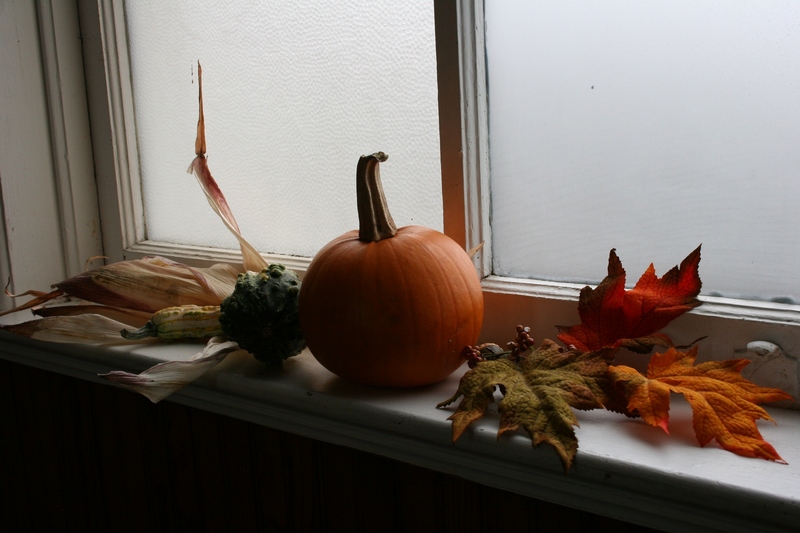 If you grew up on a farm in the 1950s and 1960s, you absolutely must read this book and Fredrickson’s other Farm Country series stories about Halloween and Christmas. He’s also published three If I Were a Farmer books. I guarantee that you will feel all warm and fuzzy and nostalgic and want to dig out the old photo albums or reminisce with your siblings. I noticed the ear flapper caps, the buckle overshoes, the checkerboard ringed silo (just like the one on my childhood farm), the old runner sled—book illustrations that are as accurate as photographs. The only difference: My albums hold black-and-white snapshots. Fredrickson captures the essence of family, of hard work, of rural life. He understands that these are worth preserving. But his efforts to save our rural heritage extend beyond his books. This writer travels across Minnesota, and sometimes out of state, presenting his message to school children, senior citizens and others. He dresses the part of a 1950s farmer in bib overalls, brings farm props, talks and reads from his books. I will tell you too that Fredrickson and his wife, Nancy, are as genuine and kind-hearted and as down-to-earth good as they come. My husband and I lunched with the couple this past summer. Although we had never met before then, having corresponded only via e-mail, I felt as comfortable with the Fredricksons as if I had known them for years. They are truly my kind of without pretenses folks. I snapped this image of the Fredricksons after lunching with them in August. I must also point out to you that Fredrickson gives me a plug on the back cover of his Thanksgiving book. He has pulled a quote from a book review I wrote. But that has absolutely nothing to do with the praise I am directing toward him here. He has earned his praise by writing these books, complete with glossaries (after I suggested a glossary), that forever preserve life on the family farm. I thank him for taking on this project with a passion rooted deep in the land. WHEN I HEARD this morning of the North Korean attack on South Korea over contested waters, I thought instantly of my dad. He fought on the front lines during the Korean War and was wounded at Heartbreak Ridge. 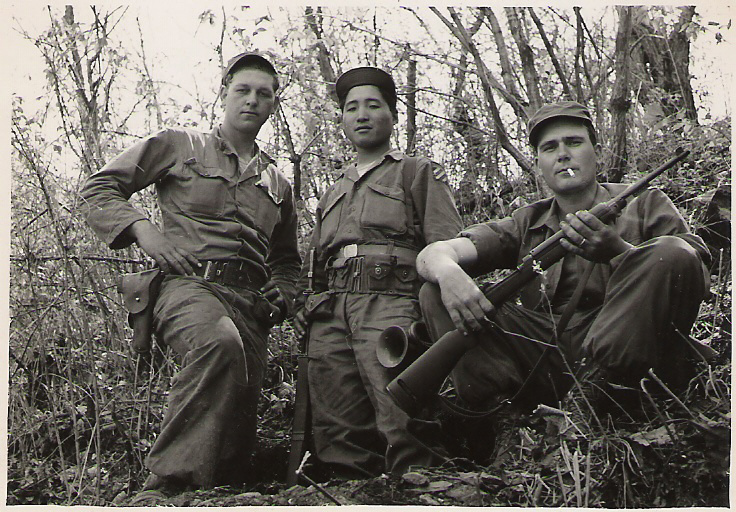 My father, Elvern Kletscher, left, with two of his soldier-buddies in Korea. He, like so many other Americans, gave of themselves in Korea and, still, 60 years later, the conflict between the north and the south remains. Were the Americans’ efforts six decades ago worth the personal losses given nothing was ever truly resolved? I know what my dad sacrificed for his country. He gave up a certain sense of inner peace. He was forever haunted by the horrors of war. That affected many facets of his life and impacted his family too. Me. My mom. My siblings. Life was sometimes a struggle for him. But my dad was lucky. He survived. He did not die, like his buddy Ray, who was blown apart the day before he was to leave Korea. My father saw his friend die. You never forget something like that. I heard the horrible, wrenching story many times. All of these thoughts passed through my mind today. I miss my dad, who died in 2003. I wonder how different he may have been had he never been called upon to defend South Korea, to kill North Koreans, to see his friends die upon the mountains of Korea. I wonder. And, yes, today, with the news of the escalating tension, my heart breaks.